Why are chicken, lamb, pork and beef the 'normal' meats? Rabbits, goats and horses are familiar animals to those in the UK and the US but rarely appear on a meat-eater's plate. Why is there so much conservatism when it comes to eating particular meats? 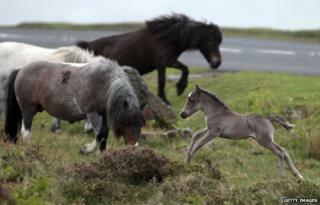 A Dartmoor hill pony charity recently suggested that the UK should start eating the creatures in order to help save them by encouraging organised breeding. It produced a welter of criticism. There is a long-standing history of disgust in the UK and the US about the idea of eating horse. Other animals have been historically eaten but declined to little more than fringe foods. There were protests in the US in August when Whole Foods were branded "bunny butchers" for starting to sell rabbit meat. The company claimed that customers had asked them for years to stock rabbit. But the outrage culminated in a "Day of Action" to let Whole Foods know "what wonderful animals rabbits are [and] remind them how popular rabbits are as pets". Novelist Jeanette Winterson similarly encountered a fierce backlash against eating rabbit when she posted a photo of one that she'd caught in her garden. The US and the UK actually have long histories of eating rabbit - especially during World War Two - but it's since become less mainstream. It's now a small-scale industry, with the UK's Department for Environment, Food and Rural Affairs (Defra) lumping rabbit meat figures in with game birds and other ground game. There's been something of a revival in certain restaurants and gastropubs, but it's far from being widely eaten. Sainsbury's doesn't stock rabbit. Waitrose used to stock it but has since stopped. The main exception is venison. Fuelled by an abundance of deer in the UK - which has led to calls for 50% culls - sales of venison soared over the last year, causing supermarkets to expand their ranges. But changing an ingrained meat culture isn't easy. In the UK, it's beef, chicken, pork, lamb. In the US, you can delete lamb from that list. Europeans seem more diverse. Horse is a long-established meat in France, albeit one in decline. And Italy, Spain and France accounted for 76% of rabbit meat production in 2005. Duck still only constitutes less than 1% of UK poultry meat production. In the US, consumption of duck and goose has decreased over the past two decades. "It is a combination of our psyche and conservative nature," says Vhari Russell, of the Food Marketing Expert, a company which advises on market trends in the food industry. "The UK is very conservative and has a small recipe base, which doesn't include many of the more unusual meats." Image caption Oh you are offal - but I like you! Even with the UK's staple meats we're not very adventurous when it comes to the more "exotic" parts of them like offal, says Ed Bedington, editor of Meat Trades Journal. "We're a little bit squeamish." Cuteness is a factor. And the wider range of species viewed as pets or companion animals throws up obstacles. Dartmoor hill pony meat is likely to cause more uproar than salivation, says Russell. And that's largely due to the miniature ponies being seen as "cute". "Lambs are cute but we still eat them quite happily," says Bedington. For TV food presenter Stefan Gates, cows are the cute ones - but still he eats them. Gates instead sees conservative meat culture as a historical hangover in the UK - a legacy of rationing in Britain both during and after World War Two. "We used to be fantastic with food, we ate everything," he says, "but because rationing went on for so long it caused this massive fissure in our food culture [which] was a generation long." British people lost some of their understanding about food, Gates adds. It was only in 1866 that horse-eating was permitted by law. Thanks to an alliance of nutritionists, social reformers and, funnily enough, animal welfare supporters, the practice was actively promoted. Many consumers are now part of the "pre-prepared" supermarket culture, says Russell. "[They] have no idea how to cook rabbit or prepare a pheasant." "Rabbit is a fantastic meat but it dries out really easily and so is harder to cook," adds Gates. "We've become lazy because a breast of chicken - although it's the most boring piece of meat on the planet - is incredibly easy to cook," says Gates. The same is true for prime cuts of meat, he says. Price is another factor. That's why food habits tend to change from the top down, suggests Gates. Those with the time and money to not worry too much about basic nutrition can be more experimental, he says. But the fact that the UK is more multicultural than in earlier decades has also expanded the availability of certain meats by creating a demand for them, says Gates. "I live in a relatively Turkish area of London, and around here it's really easy to buy things like lamb's testicles and lamb's tongues," he says. "When I have a barbecue at my house I chuck some testicles on the fire, there's some hearts, and they're amazing." Jamaican cuisine has introduced the goat - often in curry form. But it's taken a while for people to get the message, says Darren Scott, co-owner of Lickle More Caribbean Kitchen in Hove. "A lot of people say, 'goat'? So what is it then?" he says, "as if they've never heard of the animal." Many avoid trying it, he says, although gradually some are starting to - but mainly when there's no jerk chicken. But it's still not easy to source the goat for Scott's curries in the UK. Once he was even sold mutton without being told. And it's cheaper for him to drive the 100-mile round trip to London than it is to buy it in nearby Brighton. The meat conservatism is consistent. "Familiarity is a potent force," says Gates, "especially when it's something as fundamental as the stuff you put in your mouth."